Whether camping out in Morris County or taking the kids to school, you might not always think of the 2017 Acura MDX performance, but it has your back. Between the powerful V6 and available SH-AWD and Sport Hybrid models, the MDX is one of the most versatile luxury crossovers on the streets of New Jersey – and it’s thanks to its performance capabilities. See what sets the MDX apart from competitors like the INFINITI QX60 as we dig into the performance features below. With 290 hp and 267 lb-ft of torque, the 3.5L V6 that comes standard makes the 2017 Acura MDX performance a high bar for the competition. Inspired by the performance technology powering the Acura NSX and RLX, the MDX Sport Hybrid features a 3.0L V6 paired with a 3-motor hybrid system and equipped with SH-AWD for a combined output of 321 hp and 289 lb-ft of torque. Rear motors work independently of each other, using torque vectoring to enhance handling through curves while providing all-wheel traction for improved handling on wet and dry pavement. Both the MDX and MDX Sport Hybrid feature Sequential SportShift paddle shifters that allow you to take full control and change gears with just the flick of a wrist. Change gears without shifting in and out of manual mode. We think the 2017 Acura MDX performance specs certainly distinguish itself from the rest of the vehicles on the road, but they’re just the start. The reason why so many drivers let performance slide to the back of their mind is because the MDX is outfitted with some of the finest luxuries, the latest technologies, and a long list of entertainment features (for kids of all ages). 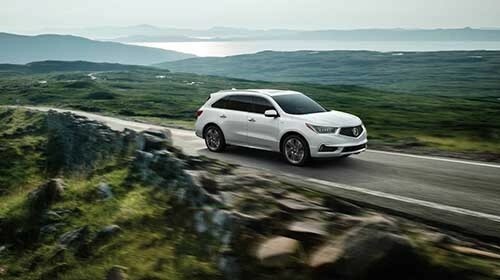 To see the MDX in action, contact Autosport Acura of Denville and schedule a test drive. We think you’ll be just as impressed by its engine revving to life as its seven-passenger seating, spacious cabin, luxurious leather seats, and standard AcuraWatch safety features.